StellaBella: Wednesday Food: Everything Is Coming Up Roasted! Our kitchen is coming together, and we are turning out some yummy meals! Now that Eric and I are both cooking professionally, we are getting inspired and looking forward to some fun dinners. For a long time I've been wanting to blog about whole roasted fish. We've done it a few times, it always comes out tasty and juicy! But first, I have some tips on how to shop for whole fish. Buy from a well respected fish market. Whole Foods can be a great place to get fish but if there is a local market, by all means, buy local! 1) First prep your potatoes by chopping them (leave the skins on! ), toss them with some olive oil, half of the minced garlic, red pepper flakes, salt, pepper and whatever herbs you'd like to add. We set these aside in our cast iron pan or you can place them on a sheet tray. 2) Next you can prep your asparagus by also tossing it in olive oil with salt and pepper. We also added some paprika, but you guys know how much we love paprika! We set these aside on a sheet tray. 3) Next prep the Bluefish by placing it in a roasting pan or in our case a casserole dish. Stuff the body cavity with half of the fresh herb mix. 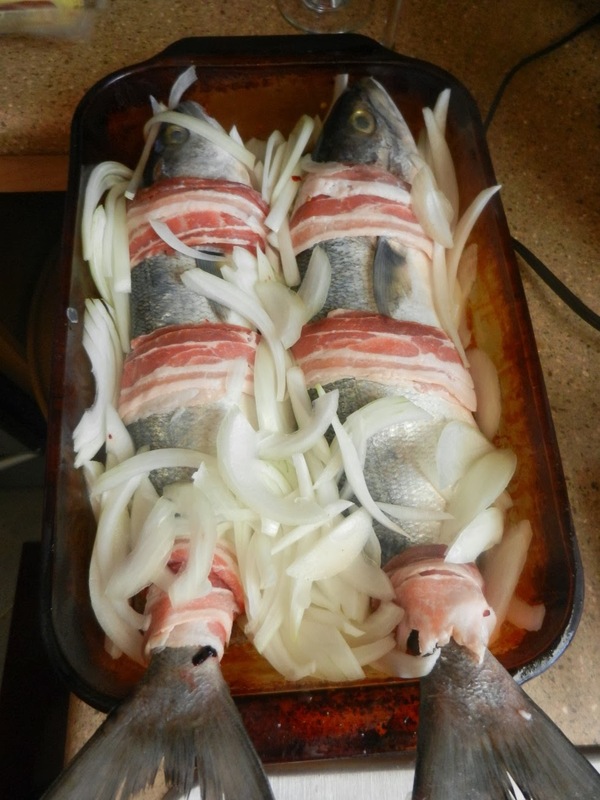 If you want you can wrap a few pieces of bacon around the fish. Add the sliced onion, the remaining amount of garlic, the rest of the herb mix, olive oil, salt and pepper to the pan. Top with the lemon slices but save the ends to squeeze over the asparagus once it comes out of the oven. 4) Everything goes in the oven at 375 degrees. The asparagus will probably be done the quickest. Once its tender, you can take it out of the oven and pop it back in later to warm up before you serve everything else. Don't forget to squeeze some lemon juice over the asparagus before you serve it! Fish doesn't take too long to cook and you don't want to overdo it. We cooked ours for about 30-45 minutes. You'll know the fish is done when the meat no longer looks translucent. And you'll know the potatoes are done once you stick a fork in 'em! Now, just because the fish has been scaled and gutted doesn't mean that there aren't any bones in it. This can be the tricky part about eating whole fish. You have to watch out for pin bones which are super tiny and sometimes hard to notice. Just be careful, take smaller bites and chew your food. I feel like fish is ultra super delicious when it's roasted whole - Try it out and see for yourselves! Until next time... when the kitchen gets too hot, get back in there and keep on cooking!